After an amazing first day of the Celebration we were excited to continue our exploration of area wineries. Our basic strategy continued: drink lots of water, severely limit wine intake, and take frequent breaks for food and relaxation. Limiting the tastings was, of course, the most difficult element of our strategy, but the most critical. Day one left us with no ill effects and plenty of enthusiasm for day two. 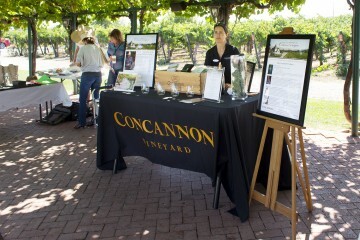 We started at one of the landmarks of the Livermore wine scene: Concannon Vineyards. Day one saw cars spilling out of the property and parking well down Tesla in both directions. We decided to beat the rush, and arrived a few minutes before noon. 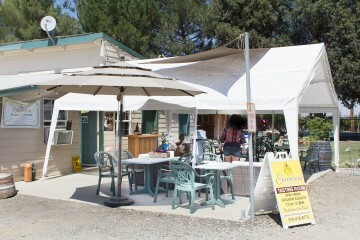 We were directed to a convenient parking lot by the Underdog Wine Bar and found the check-in table on the edge of the magnificent picnic grounds. The tree-covered grassy area for picnics was so popular that many visitors were already enjoying the day from their blankets spread in the ample shade. 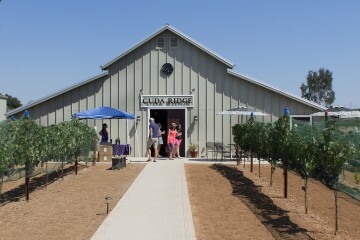 Although enticing, we had a long list of wineries to visit, so we stayed strong and sought out the tasting station. After we chose a splash of wine, we wandered the grounds, checking out the various vendors and the amazing topiary. Our next stop was the dynamic duo of Crooked Vine / Stony Ridge Winery. Two labels, one stop. 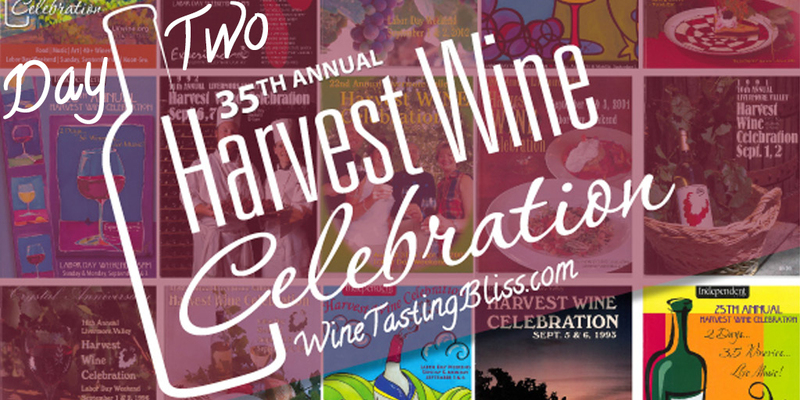 A great opportunity, especially on a busy weekend like Harvest Wine Celebration. We drove in and found that we had beaten the crowd! Yes, there was wine, staff to pour said wine, but no other tasters. We distinctly heard angels singing. We met wine guides Katy and Melonie, who welcomed us and gave us some wine to taste. We compared notes on the previous day’s happenings with them and soaked in a bit of peace and quiet. We knew that multitudes of happy wine tasters were not far behind us, so we savored the moment as we savored the lovely wine. Just across the street and 100 yards over is the fearsome foursome of Tesla Vintners. One parking lot with four tasting rooms. Boom! Definitely worth checking out before the crowds hit. First up was Ehrenberg Cellars. 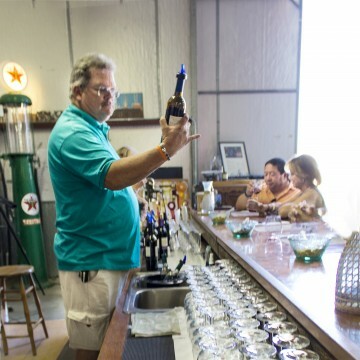 Don’t let the small tasting room fool you, this winery has a lot to offer! We met wine guide and investor Patricia, who poured some lovely Zinfandel for us and recounted some tales of fun from the previous day. Fun wine, served in a fun environment! 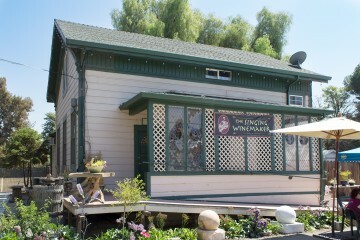 The founding winery of Tesla Vintners is the Singing Winemaker. The winery’s name comes honestly, because when the winemaker is in the tasting room, everyone is treated to professional-quality vocals and acoustic guitar. 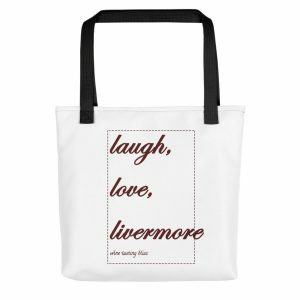 We sampled some of their signature almond flavored sparkling wine, chatted with the staff and other tasters, and did some shopping. It is a rare visit when we leave without both wine and some knick-knacks. Today was no exception. 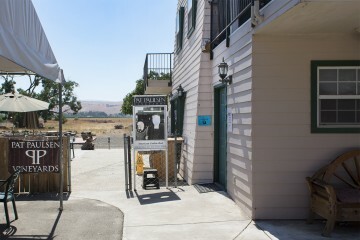 Only steps away from the Singing Winemaker is the Pat Paulson Winery. We entered the cozy tasting room to discover that there was only one other group tasting. We met wine guide Mike who poured us Zinfandels from two different vineyards. Although we tasted each other’s wine, Mike had intuitively poured each of us our favorite. Well done Mike! 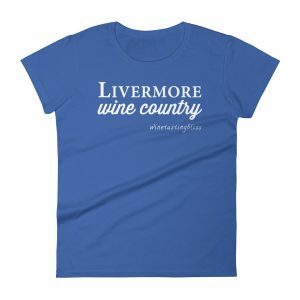 The fourth and newest addition to Tesla Vintners is Lone Dove Wines. We never pass up a chance to chat with owner/winemaker George Natsis, and to discover the new wine creations he is pouring. 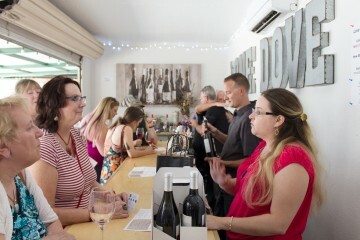 We arrived to find the tasting bar full of engaged wine tasters, with most of the patio tables hosting even more fans. George, his wife Stella, and new wine guide John were all pouring wine and making more true believers. We tasted their new sparkling (delicious!) and then experienced one of George’s trademark moves: the in-glass wine blend. He mixed a splash of this wine, a splash of that, plus half a splash of a third. As in the past, the result was amazing and tantalizing. Now we have to wait until next spring to buy this blend in a bottle! Our next stop was a long-time favorite: Eagle Ridge Vineyard. With the amazing weather, this winery’s location, perched atop a bona fide ridge, was beautiful beyond description. We drove past the vines heavy with fruit, to taste the harvest of past seasons. The bar was already full of happy wine tasters, so we found an open wine barrel table and got comfortable. We violated our “one taste per winery” strategy, tasting both the Petite Sirah and the Zinfandel. 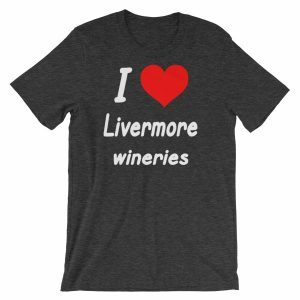 But then, owner/winemaker Jim Perry knows his way around both varietals and we just couldn’t resist. 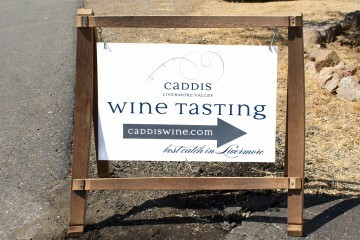 Like Wood Family Vineyards, neighbor Caddis Wines is only open to the public for a few weekends a year. Our previous visit was on their opening weekend, with owners Courtney and Chris Sorensen celebrating their engagement and their winery at once. Now, the tasting room and staff show the refinement of time. Their 2012 Tempranillo was a hit with both of us! Cuda Ridge was advertising music and food for BOTH days of the Celebration, so we made sure to put them on our tour list. We arrived to find the party in full swing! As promised, there was a band with a food truck right behind. 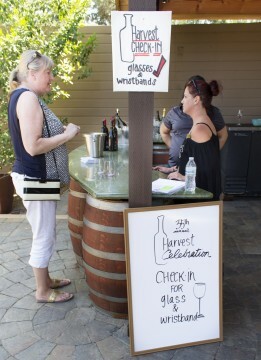 We ducked into the tasting room for a splash of wine and found several interesting craft tables and some welcome air conditioning. Sipping and shopping ensued. And some buying, to be honest. We then found a table outside, purchased lunch and enjoyed the very danceable Modesto Roy and the Catfish Boys. Moments like this are what the Harvest Wine Celebration is all about! It was approaching closing time. Yes, the Celebration was coming to an end for the year. Sigh. 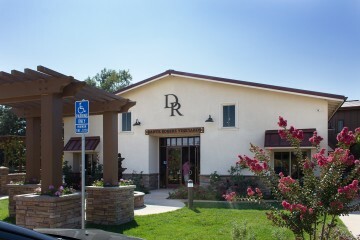 We wanted to finish strong, so we selected one of our favorites, a winery with a beautiful new tasting room: Dante Robere Vineyards. The tasting room was still full of happy wine tasters when we arrived, and co-founder Dan Rosenberg welcomed us and made us feel welcome despite the late hour. We tasted a few of their new releases, and chose a bottle of Paradiso (an Iberian blend of 50% Carignane, 33% Tempranillo & 17% Touriga) to take home. This Celebration was a wrap!